Looking for a unique way to feed a small or large group of people? We have the perfect solution. Call us today for pricing. The Walke Brothers name has come to signify exceptional quality in all of our products and services. Whether it's bratwurst for your next tailgater, a USDA Choice Rib Roast for your holiday gathering or barbeque for the company picnic. Walke Brothers looks forward to serving you! Walke Brothers Barbeque Sauce is prepared with the finest ingredients to provide you the same great tasting recipe that has been in our family for four generations. The blend of seasonings is the perfect compliments to beef, pork and chicken. 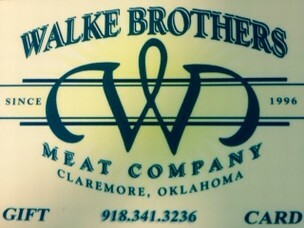 It's always grilling season and Walke Brothers continues to offer new sausages for your weekend event or evening meal. Walke Brothers would like to thank Craig Day, Chef Mike Fusco and Rich Lenz from KOTV Channel 6 in Tulsa for stopping by to visit us and enjoy some of our products. We invite you to stop by and browse our selection of specialty smoked and fresh sausages, succulent meats and cheeses. Complete your cutting card here.